Not even the Supreme Court can stop the Congressional Black Caucus from moving forward in its mission to protect African-American voters and others at the polls. 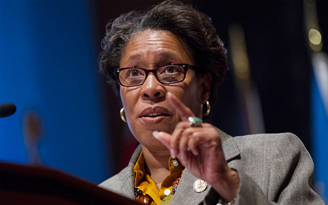 Rep. Marcia Fudge (D-Ohio), led a contingent of caucus members and several minority groups in a public plea to Republicans on June 18 to take up legislation that would restore the voting rights protections shot down last year by the nation’s highest court. The Congressional Black Caucus (CBC) and other Democrats have urged lawmakers to update the 1965 Voting Rights Act. In 2013, the High Court voted to strike down key components of the law, including allowing nine states to change their voting requirements without advance approval from the federal government. Fudge and other Democratic legislators said Goodlatte, (R-Va.), who serves as the House Judiciary Chairman, has blocked efforts to get a bill passed that would restore portions of the law that the Supreme Court struck down. Democrats are seeking greater protection for minority voters and they want to ensure that individuals aren’t turned away from the polls because they don’t have proper identification or for other reasons. Goodlatte, 61, has vowed to protect voting rights. However, with June quickly coming to a close and legislators preparing to return to their home states for summer break, without a resolution Congress would be hard pressed to pass a bill prior to the November midterm elections. It’s that scenario that Democrats said they fear because many minority voters could find it difficult to cast their ballots with the way the law currently stands. “Voting is the language of the American democracy, if you don’t vote, you don’t count,” said Wade Henderson, president and CEO of the Leadership Conference on Civil and Human Rights in Northwest. CBC members and leaders of several other groups said they recognize this time as being crucial in the battle to achieve a more balanced voting rights law. Lorraine Miller, interim president and CEO of the National Association for the Advancement of Colored People, said it’s imperative that Congress act now.